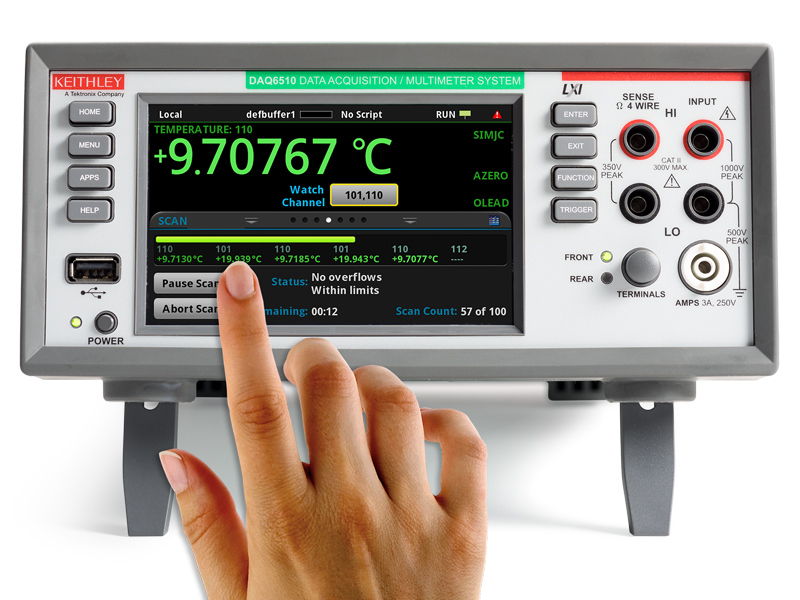 The Keithley DAQ6510 is a brand new 6½ digit Data Acqusition and Logging Multimeter System. It has a large 5-inch (12.7 cm) capacitive touch screen display that makes it easy to observe, interact with, and explore measurements, with its "pinch and zoom" simplicity. Beyond its display technology, the DAQ6510 has a superior analog measurement performance, that delivers 25 ppm basic DCV accuracy for one year and 30 ppm for two years, potentially allowing to extend your calibration cycles. This DAQ6510 Digital Multimeter System has 15 measurement functions including capacitance and temperature with RTD, Thermistor or TC Sensors. Furthermore the DAQ6510 offers a digitize function for Voltage and Current with a 1MHz/16bit ADC. USB- and LXI-Interfaces are standard, GPIB and RS232 are available as field installable option. The DAQ6510 may be extended to 80 input channels with plugin 77xx series scanner cards. The unit is software compatible to the legendary series 2700. Three-year warranty.